During term 6, Key Stage 2 pupils were set the task of designing a well balanced and healthy menu for a lunchtime meal. This was to be served to the whole school, as well as their parents, and invited community groups (governors, the Friendly Club and the ‘Open the Book’, organisation). The menu consisted of 3 courses; Summer Vegetable Soup with homemade bread to start, followed by chicken and roast vegetable kebabs and fruity couscous dressed with lemon and parsley, and finally pudding was the children’s version of millionaire shortbread, served with fresh fruit. 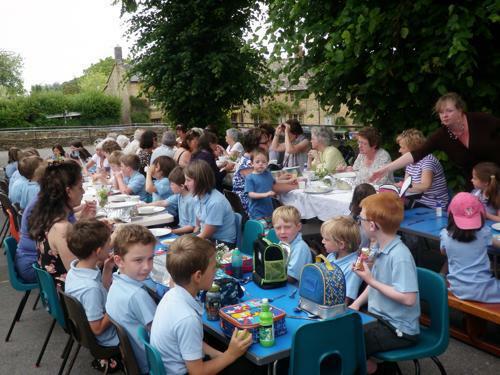 On Monday 27th June, lunch was served, on trestle tables, outside in the playground. The children prepared the lunch in the school kitchen with the help of the headteacher, Clare Fisher, and Junior Class teacher Wendy Wilkins. School Foundation Governor, Jenny Hitchman said, ‘Lunch was wonderful, absolutely lovely and beautifully presented by the children’. The headteacher, Clare Fisher, commented that, ‘It was a wonderful event; a real joy to see the children and the local community enjoying lunch together outside, under the trees’.